To close out the year, UK Sailmakers asked its loft owners from around the world to share with us, and you, some of their most memorable moments from 2018. Here are four of them and, in each, you will get the sense that the folks at UK Sailmakers live up to the corporate slogan: Sailmaking is what we do, sharing our passion for sailing is why we do it. We hope you enjoy these sea tales and have a healthy and prosperous New Year. The 2018 event that stood out for UK Sweden’s Mikael Olesen was the 350-mile AF Offshore Race also known as the Around Gotland Race. Olesen sailed this iconic race aboard the brand new Arcona 465 named FLYT that had had its very first sail just three days before the start. While Olesen and crew acknowledged that sailing a long-distance, offshore race without having had a proper shakedown period was a dicey call; they went after inspecting the boat, gear, and sails the best they could. The Arcona 465 FLYT showing off her Uni-Titanium sails while sailing out to the Baltic Sea. The race started right off downtown Stockholm and then weaved through the islands of the Stockholm archipelago. The UK Sailmakers’ Uni-Titanium upwind sails fit and performed perfectly out of their bags as they were immediately put to an extreme test that they passed with flying colors. Eventually the fleet got free of the islands and into the Baltic for a 16-hour downwind sleighride in 30-34 knot winds sailing to Hoburgen at the southern-most point of Gotland Island. At that point in the race, FLYT was fourth in fleet of 237 boats. Video shot on FLYT speeding down the Baltic Sea to Gotland Island. On the leg north to the finish off Sandhamn Island the wind got lighter and shifted. While the fastest boats had to beat all the way back from Gotland in the dying breeze, the slower boats got lifted to the finish. FLYT ended up 6thin the 50+ boat SRS A division and 13thoverall out of 237 boats. That result is not too shabby for a racer/cruiser with a full interior that had never been fully tested. Great results...and good fortune! The 1995 IMX 38 BRAVEHEART sailing with an X-Drive No. 1 genoa and older Tape-Drive main. During every sailing season it seems like there was always one regatta or race that sticks out in your mind. For UK Norway’s Mehmet Taylan, that regatta was the 2018 Nesodden Høstcup. Taylan was aboard Kim Knudsen’s 1995 IMX 38 BRAVEHEART, clearly a “vintage” yacht amidst a fleet of newer, hotshot racers. Although BRAVEHEART finished second and not first, it was a moral victory that made the Nesodden Høstcup so memorable. The only boat that beat BRAVEHEART in the two-day event was a right out of the box Club Swan 50, a 2-million Euro 50-footer with a competitor’s top-of-the-line sails flying. That was quite an investment to beat the 23-year-old, 50,000 Euro 38-footer with X-Drive and Tape-Drive sails from UK Sailmakers. Third was an X46 and fourth was a new Grand Soleil 42R. 2018 Nesodden Høstcup results for half of the fleet. The regatta consisted of two distance races. On the windy first day, the Swan 50 PROXFLYER legged out on the fleet and BRAVEHEART was fourth. Sunday the wind was light and shifty and BRAVEHEART beat the Swan. It appeared that the Swan’s sails were too rigid and couldn’t be adjusted to fly in the light air while BRAVEHEART’s UK sails were easily trimmed and adjusted to excel in the lighter conditions. BRAVEHEART was truly the warrior that could slay giants. Morten Ullmann, owner of UK Sailmakers Denmark has been specializing in one-design sails for years. When his son Jonas became active in the Optimist Dinghy, Morten not only coached Jonas and his friends, he developed race winning sails that are still being used throughout Denmark. When Jonas aged out of the Opti and moved on to the Europe Dinghy, Morten brought his sail design and sailmaking skills to bear on that class. 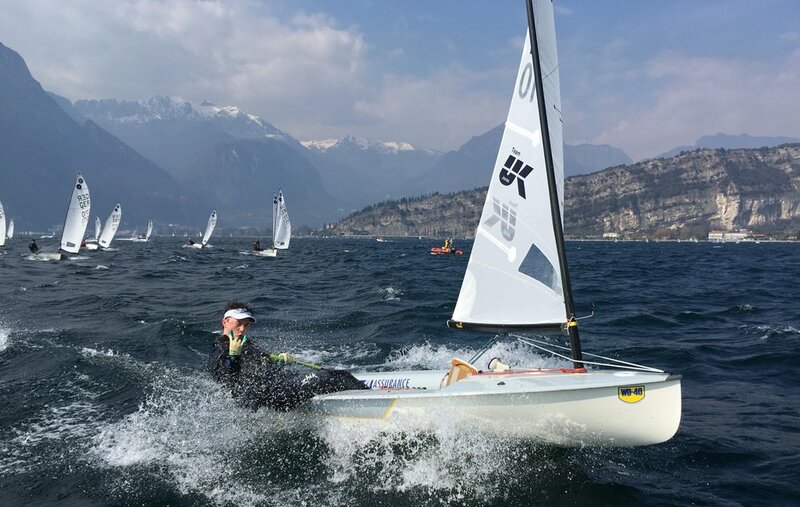 The following was written by Jonas about working with his father to develop a Europe Dinghy sail that in 2018 won the European Championship, the European Masters, was third at the Worlds, took all the podium positions at the Danish Youth Champion as well as all the podium positions at the Danish Championship. Light winds dominated the 2018 Newport to Bermuda Race. Shown here is the starboard watch on the Marten 49 SUMMER STORM. From the wheel forward: Andrew Berdon, Alden Winder, Ben Cormack, Walker Potts. Josh Reisberg photo. 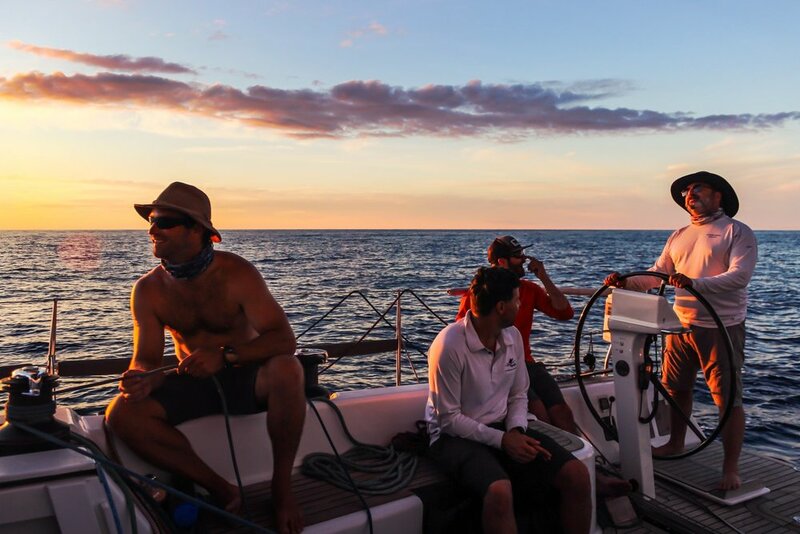 “This was my eighth race to Bermuda and it was a light air affair. At one point while spending my off-watch sleeping on deck, I was awakened by the frustrated Starboard watch crew who had run out of wind. As if out of a last resort, the owner Andrew Berdon asked me if I had any ideas how to get the boat moving again. I looked around at the sails, the sea and the sky and gave a shrug. Then, I spotted a small puff of wind a boat length to windward that none of the guys on watch had seen. They had become so frustrated that they had given up looking for wind. It’s not often that you can make a call that has that dramatic an effect on the boat’s performance, but when you do, make the most of it, accept that you’re the hero, and make it fun. Don’t forget to keep your sense of humor for those calls you’ll eventually make that will not work out. Left: SUMMER STORM in the 2018 Stamford-Vineyard Race; Kevin Dailey photo. Above: scenes during the 2018 Bermuda Race on SUMMER STORM. Top by Eric Irwin, above by Josh Reisberg. When the new sail you’ve ordered is delivered, you expect it to fit your boat properly right out of the bag. Unfortunately, in too many instances this just isn’t the case. To make sure the sail you receive is the sail you ordered, most UK Sailmakers lofts are now using a powerful digital sail-design tool to insure your sail will fit perfectly the first time it is set. BSG Development’s Sailcom electronic sail order form and project viewer allows your UK sailmaker to input the measurements he’s taken of your boat and rig and digitally display the recommended sail in 3-D. This ensures that the luff and foot will be the right length, that the leech isn’t too long, and that the reef points and spreader/stanchion patches are in the right places. By rotating the 3-D image of your boat and sail plan, you can get an accurate, graphic view of how the new sail will look when set. Even if we don’t get all the boat’s measurements, Sailcom can create an accurate graphic representation of a proposed sail. In addition to the fit reassurance Sailcom offers, UK’s detailed technical sail construction standards have been programmed into our version of the program whereby we can display our various laminate and tape styles. Patches, battens and reefs are also shown in place. After capturing and presenting your proposed sail, Sailcom transfers this data seamlessly to SailPack, the industry’s leading sail design program. By combining SailCom with SailPack, your sailmaker, UK’s sail design team, and you the customer have a powerful “all in one” tool at your fingertips that will deliver accurate information about the size, shape, look and fit of the sail before being manufactured. The direct interface between Sailcom and SailPack also prevents the transposing of measurement data as the numbers are delivered to the sail designer. In the end, UK Sailmakers delivers to you a well-designed, well-made, and properly-fitting sail that will bring you seasons of satisfaction and sailing enjoyment. Isn’t that what it’s all about? PANACEA squeezing inside The CRO CONNECTION at the committee boat. X-Drive vs. Tri-Radial. 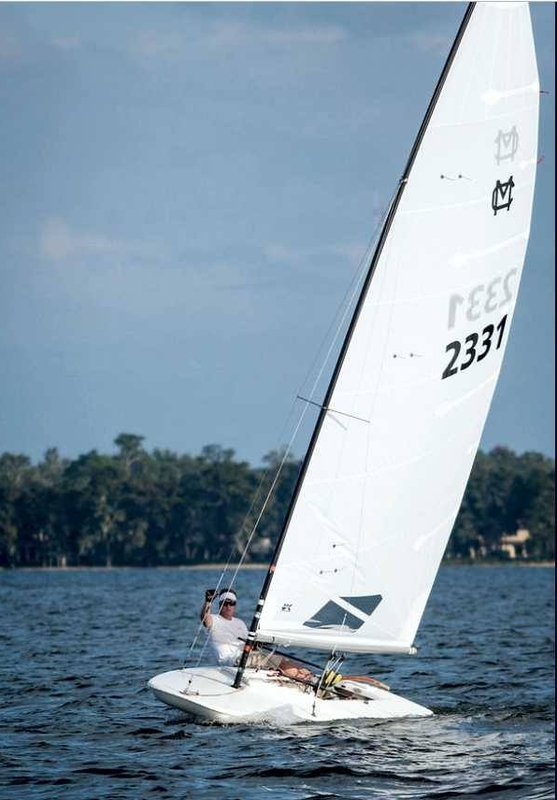 James Freedman and his crew sailing MISS CONDUCT won the 2018 seven-regatta J/24 Texas Circuit that is sailed throughout huge state of Texas. His team was dominant, winning four of the seven regattas. Shown above is MISS CONDUCT on her way to winning the J/Fest Regatta on Galveston Bay with 4 bullets out of 6 races. In 2017, MISS CONDUCT finished second in the Texas Circuit and the 2018 victory was the step-up the team had been after. Doug Weekly sailing with a UK Sailmakers spinnaker Lake Canyon. Notice how well the head of the chute opens. Ft. Worth, Dallas, Austin, 2 in Houston and Lake Canyon near San Antonio. 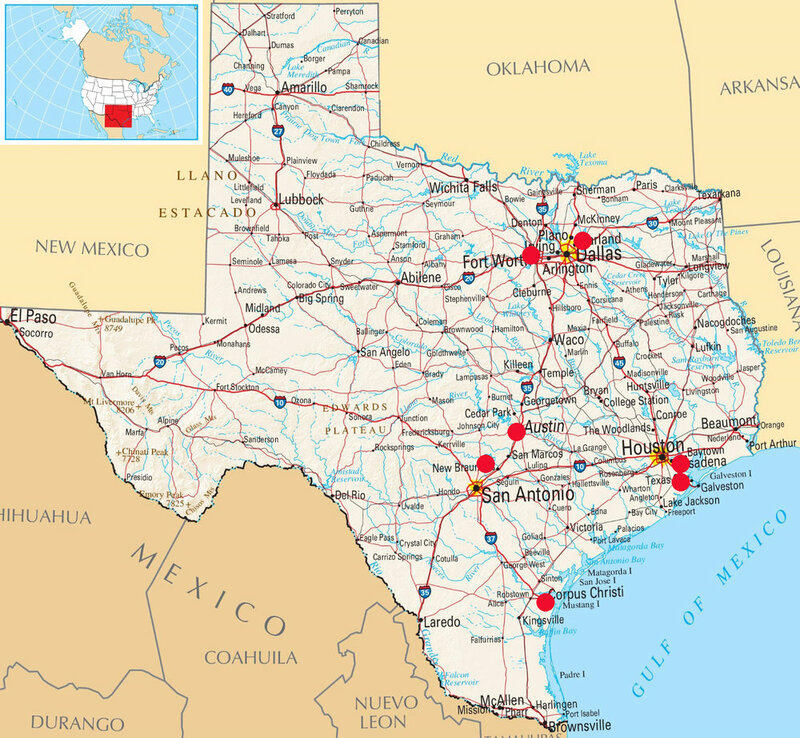 The Texas Circuit is one of the most active hotbeds of J/24 sailing in the USA. In fact, the boat that finished second in the 2018 series had finished 4th out of 48 at the 2018 Nationals in Maine. The Texas Circuit is a great test of sailors and sails since the different regattas are sailed on lakes as well bays off the Gulf of Mexico. The Circuit is also a good test of logistics since there are hundreds of miles of highway driving between some of the events. 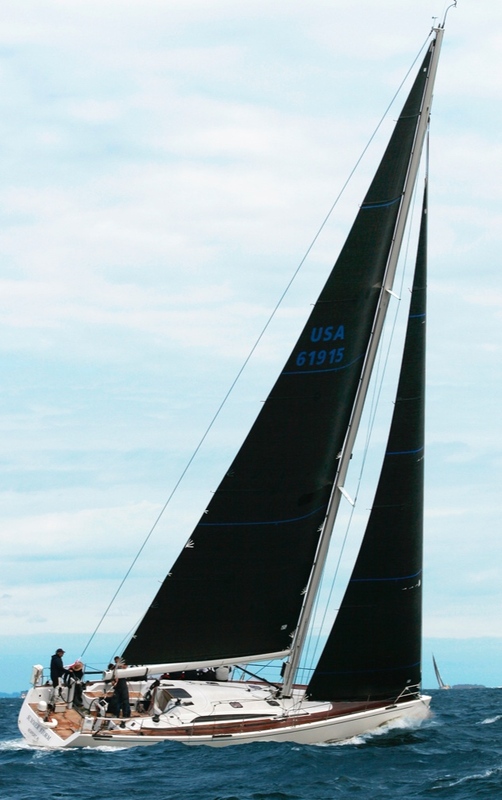 Freedman uses UK Sailmakers Texas’ J/24 one-design inventory that includes the all-purpose Radial Head Mainsail made of Dimension Polyant’s 260HTP, a full Runner Spinnaker made of Bainbridge’s AIRX650 and Black Aramid Pro Racing Genoa, make with black aramid load-path yarns. Good shots of MISS CONDUCT’s Black Aramd Pro Racing genoa. MISS CONDUCT crossing the finish line with no others in site. Pedro Gianotti of UK Sailmakers Texas has been developing his J/24 sails for over a decade. This is not the first time UK’s J/24 sails have taken the Circuit; in 2014, UK New York’s Emmett Dickheiser sailed with Stuart Ludlow when they won the Circuit. For fast J/24 sails, call your local UK Sailmakers loft. The English car designer Sir Frederick Henry Royce who, with Charles Rolls, founded the Rolls-Royce, once said, "The quality will remain long after the price is forgotten,” and that truly applies to UK Sailmakers' Uni-Titanium Liteskin sails. While Uni-Titanium is our most expensive line of sails, these grand prix sails hold their trimmed shape perfectly while being the lightest and strongest sails we make. On the water results show they are not only fast, but they last. The Judel-Vrolijk 66 DEFIANCE pressing downwind. Here’s proof: In 2018 Chicago sailor Dale Smirl’s Judel-Vrolijk 66 DEFIANCE won the Lake Michigan Overall PHRF Distance Series for the seventh year in a row. Smirl said, “Not only are our sails fast, but I have never seen sails for a boat this size last so long. DEFIANCE’s Uni-Titanium mainsail just finished its fifth season, which is much more than I ever expected. UK Sailmakers’ sails definitely have superior longevity and durability.” His mainsail is a monster – 85 feet on the luff by 30 feet on the foot for a total of 1,550 square feet. The Uni-Titanium Liteskin main on SOULMATES as she is on her way to setting a new course record in the Douglaston Yacht Squadron’s Captain’s Island Race. M. A. Fisher Photography. If DEFIANCE’s performance doesn’t convince you to consider Uni-Titanium sails for your boat, let me tell you about my own Uni-Titanium Liteskin mainsail. My boat is custom-designed 40-footer designed by Rodger Martin and built by Eric Goetz in 1992. The boat’s name is SOULMATES, which I sail on New York’s Long Island Sound. The Uni main just finished its third full season and it is still fast and smooth. In 2018, SOULMATES won the Yacht Racing Association of Long Island Sound’s inshore season championship for the fastest PHRF boats – the Gitana Trophy. Click her to see a video of the sail taken during the 2018 Turkey Day Reach, the last race of the of the season. While not as big as DEFIANCE’s, SOULMATES’ main is still big for a 40-footer; the luff is over 56 feet and the foot 19.5 feet. 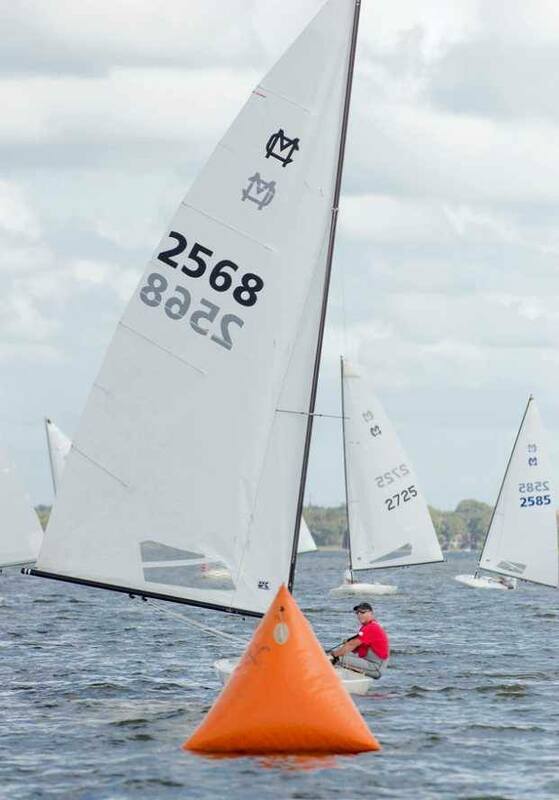 Five years ago the first set of UK’s MC Scow sails made their incredible debut at the 2013 Southeast Regionals winning an impressive five of the six races including all four of the first day of racing. Fast forward to 2018 and our sails are still blazing fast. At the 2018 SER Regatta UK Sailmakers sails won four of the six races and the regatta! We know these regattas are won by great sailors but great sailors are always looking for their edge and they are finding it with UK Sailmakers Chicago. Congratulations to Jeremy Pape for winning the 2018 MC Scow SE Regional. Other congratulations go to Chris Brooks for winning race 1 and Craig Eaton for finishing in the top five the first time using his new UK PS 1 MC sail. With Jeremy Pape’s victory at this event and Mike Considine’s victory at the 2018 MC Scow Blue Chip, UK Sailmakers’ MC sails have won the final two major events of the year on the MC Scow circuit.